Convert audio to MP3 from .m4v video? I have some M4V videos and want to convert some tracks to MP3 for playback in my car or burning to CD. Is there any good audio to MP3 audio ripping programs for MP3 audio rip from a video file? - from CNET Your purchased M4V music video files may be such a bargain if you convert them to MP3 format for playback on iPod, iPhone, mobile devices or in your cars etc. since you don't need to pay for the same songs again. There are so many professional yet easy solutions to extract MP3 audio from M4V files. Try the below free video converter for Mac/Win we share. 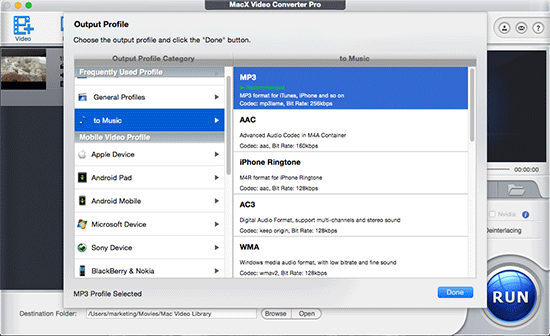 MacX Video Converter Pro edges out other M4V to MP3 converter freeware. You can benefit a lot from the reliable video converter for Mac/Windows. * Extract MP3 audio from M4V videos with nearly original sound quality. * Convert M4V, MP4, AVI, etc, videos to MP3, AAC, AC3, iPhone Ringtone, WMA etc. audio files. * Download MP3 audio song from SoundCloud, Audiomack, etc. free music sites in a click. * Download music videos, online videos from YouTube, Vevo, Vimeo, FaceBook 300+ online sites. * Support to rip MP3 audio from M4V on the latest macOS High Sierra, macOS Sierra, Window 10 and earlier. * No limits on the number of M4V videos and file size you can convert. Free download the converter for Mac or for Windows and launch the software on your computer. Click Add Video icon in the top left corner and select source M4V files from your computer. The MP3 audio extractor supports batch conversion, meaning that you can add more than one M4V file each time. Alternatively, you can directly drag and drop M4V files you'd like to convert to the main interface. After source videos are loaded successfully, you'll see the Output Profile window. Select "to Music" and choose MP3, then click OK to save the output profile setting and close the window. Tips: Click settings tab to get access to adjust MP3 audio parameters, like audio codec, sample rate, bitrate, audio channels etc. Click Browse icon and select a destination folder to store converted files. If you are fine with the default folder, just skip this step. After you've all set with the settings, click RUN tab to start to extract MP3 from M4V videos. The time it takes also depends on the source video file size. Thanks to HT tech and hardware acceleration, the program should convert M4V to MP3 with at least 5X faster than other MP3 audio extractors. The steps are applicable to convert MP4 to MP3, MKV to MP4, M4V to AVI, FLV to MP4, WMV to MOV, MP4 to AAC/iPhone ringtone format and more. Online M4V converters for Mac/Win are easy to use and users can use them to extract MP3 from M4V without the need to install software. But many online programs have file size limits (max 100MB), such as convertio, ZAMZAR. Here we are going to introduce cloudconvert that allows users to convert M4V to MP3 online and store the converted file to cloud services like Dropbox, Google Drive, One Drive, Box. However, don't expect too much if you are a free registered user. The maximum conversion time per file per day is 25 minutes and the maximum file size is 1GB. And upload error (-200: HTTP Error.) 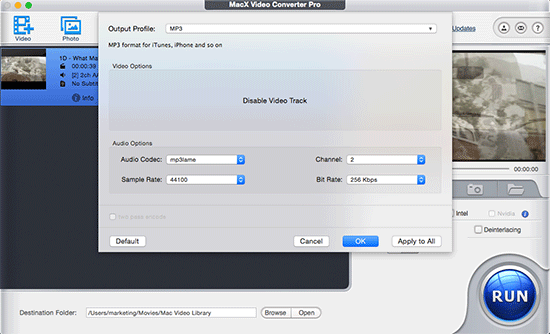 message will pop up if you convert iTunes DRM-ed M4V video to MP3 online with cloudconvert. 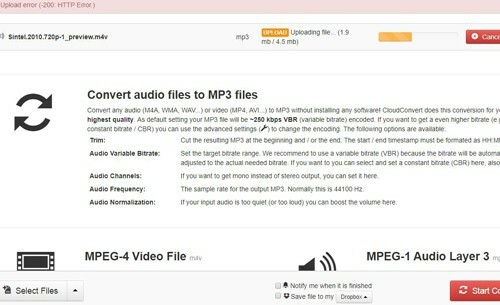 Use steps below to extract MP3 audio from M4V free online. Note: if you are going to convert iTunes DRM M4V video to MP3 audio, you have to remove DRM from iTunes M4V video file with the help of DRM removal software. MacX MediaTrans is good at doing that. It's easy and fast. You can use the tool to convert DRM M4V to MP4, and DRM copy protection is auto removed during the conversion process. Then continue to use steps below for MP3 extraction. Step 1: Go to the homepage of the cloudconvert. Step 2: Click Select Files and choose M4V files you'd like to convert from the popping up window or open the drop-down menu to choose from Dropbox, Google Drive, OneDrive, Box or add from URL. Step 3: After M4V files are analyzed successfully, click the output format drop-down tab, choose audio > mp3. Step 4: Click the advanced settings icon to get more conversion options, like trimming, adjusting audio variable bitrate, channels, frequency, and normalization. Then click Okay to save the settings. Step 5: Select Dropbox, or Google Drive, OneDrive, Box to save converted files. Step 6: Click Start Conversion to begin to extract MP3 audio from M4V. Free download the best video converter for Mac/Windows to extract MP3 from M4V, as well as MP4 to MP3, AAC, AC3, MKV to MP4, M4V to MP4, AVI to MP4, AVCHD to iPhone, FLV to iPhone, YouTube to MP4/MP3, etc. Also download MP3 songs from SoundCloud, Audiomack, YouTube, Vimeo, Vevo etc. 300+ music sites.